Advocates of strong net neutrality rules are calling for the U.S. Federal Communications Commission to reclassify broadband as a regulated utility, but such a move would trigger a lengthy court fight between the agency and broadband providers, some telecom law experts say. 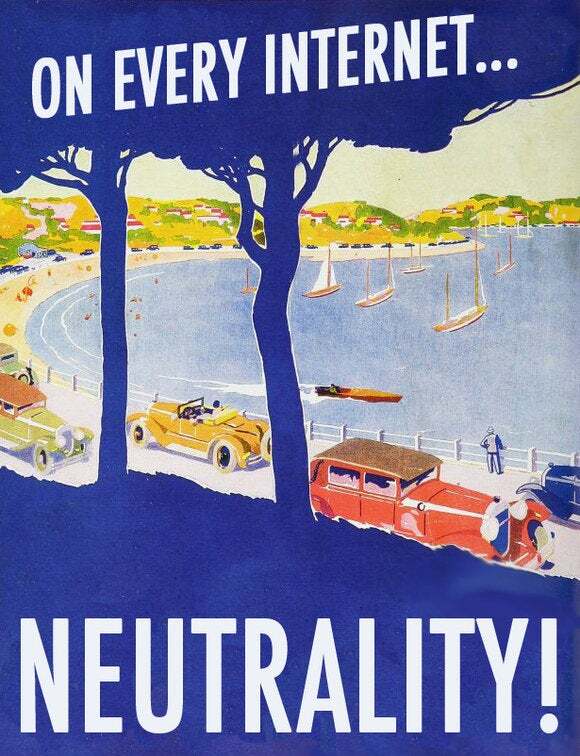 With net neutrality back on the FCC’s agenda in recent weeks, many net neutrality advocates—including digital rights groups Free Press and Public Knowledge—have resurrected their long-time push for the FCC to reregulate broadband as a traditional telecom service as an alternative to FCC Chairman Tom Wheeler’s proposed set of regulations, released in late April, that they view as too weak. Despite a large public outcry—the FCC has received more than 45,000 public comments in the past month, with many calling for reregulation—some telecom law experts question whether the agency will take that step. 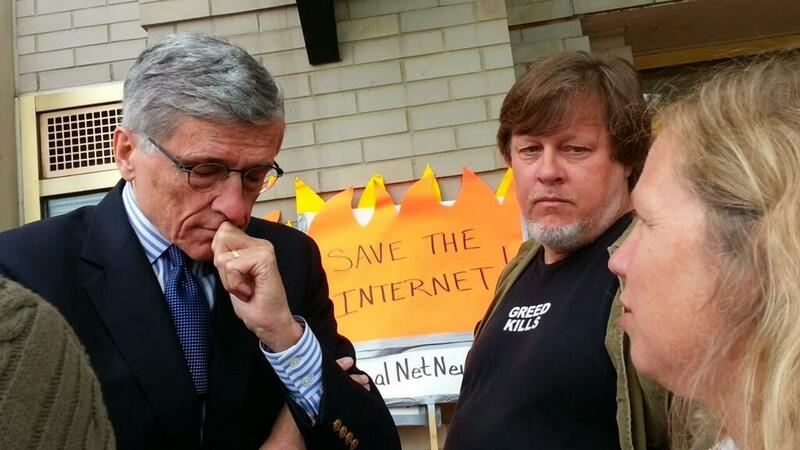 Tom Wheeler (left), chairman of the U.S. Federal Communications Commission, meets with net neutrality advocates Kevin Zeese and Margaret Flowers. The FCC, in a public notice of proposed rules released earlier this month, asked for comment on Wheeler’s proposal, which would allow broadband carriers to engage in “commercially reasonable” traffic management, and also on whether the FCC should reclassify broadband as a common-carrier telecom service subject to utility-type regulations under Title II of the Telecommunications Act. Is a legal backlash worth it? But Nadler and some other telecom regulation experts expect a huge legal backlash if the FCC moves toward Title II regulation. “If the FCC were to reclassify broadband as a telecom service, lawyers for the major telcos and cable systems would immediately start lining up in front of the court of appeals and would file petitions for review within minutes after the order was published,” Nadler said. Broadband providers would argue that reclassification is a “trillion-dollar bait-and-switch,” said Scott Cleland, chairman of the NetCompetition advocacy group supported by broadband providers. Providers would argue that a change in classification would be arbitrary and capricious, the classic language of a challenge to agency regulations. Harold Feld, senior vice president at Public Knowledge, downplayed potential arguments by broadband providers. In a handful of recent Supreme Court cases, justices have suggested the FCC has the authority to change its mind, he noted. Asked if reclassification would trigger a backlash in Congress, Feld said it might, particularly if Republicans gain majority control of the Senate in elections later this year. But Congress would have a difficult time overturning the rules, he said. A Republican Congress would likely attempt to overturn any net neutrality rules, Feld noted. Whether the FCC relies on reclassification or takes another route, it “makes no difference if the Senate flips, so you might as well do what you think is right,” he said. Net neutrality advocate Marvin Ammori of the Ammori Group law firm also discounted the broadband providers’ chances of overturning reclassification. Wheeler has defended his proposal, which uses Section 706 of the Telecom Act, a section giving the agency responsibility for robust broadband deployment, as a quicker way to restore net neutrality rules after the U.S. Court of Appeals for the District of Columbia Circuit struck down an old version of the FCC’s net neutrality rules in January. The appeals court pointed to Section 706 as a way the agency could find authority for net neutrality rules, and Wheeler has argued that it makes sense to follow the court’s lead after judges there twice struck down the agency’s attempts to enforce net neutrality rules. Alternatively, reclassification would “not be as straightforward or easy as many assume,” said Berin Szoka, president of free-market think tank TechFreedom. Reclassifying broadband as a utility “would take, best guess, five to 10 years of back and forth between the FCC and courts,” he added. The agency, to reclassify, would have to find a justification for changing its mind on its decade-old classification of broadband as a lightly regulated information service, Szoka said. Reclassification would be additionally complex because the agency would also have to draw a line between broadband and other Internet services, Szoka said. The FCC would “have to explain why it should only reclassify broadband and not some edge services, too,” he added. Some opponents of reclassification have questioned whether the FCC has the authority to reverse a series of decisions in the early 2000s to classify cable broadband, then telecom broadband as an information service. But many telecom law experts say the agency does have that authority, as long as it justifies its reasons for the switch in policy. Ironically, clear authority for the FCC to change its mind comes from the 2005 Supreme Court case that ruled the FCC had the authority to deregulate broadband and classify it as an information service. In the Brand X case, the Supreme Court ruled that the agency had reasonably interpreted the Telecom Act when classifying cable broadband as a lightly regulated service. The Brand X case “makes clear that the courts must defer to any reasonable interpretation” of the Telecom Act that the FCC makes, Nadler said. Justice Clarence Thomas, writing for the majority in the Brand X case, also notes that government agencies can change their policies if they have a good reason.